Let’s first take a look at a complete trade. This 8-hour USD/CHF chart shows a strong downtrend and an “ABC” move in June. Point B was at the .8328 level while point C was at the .8553 level. 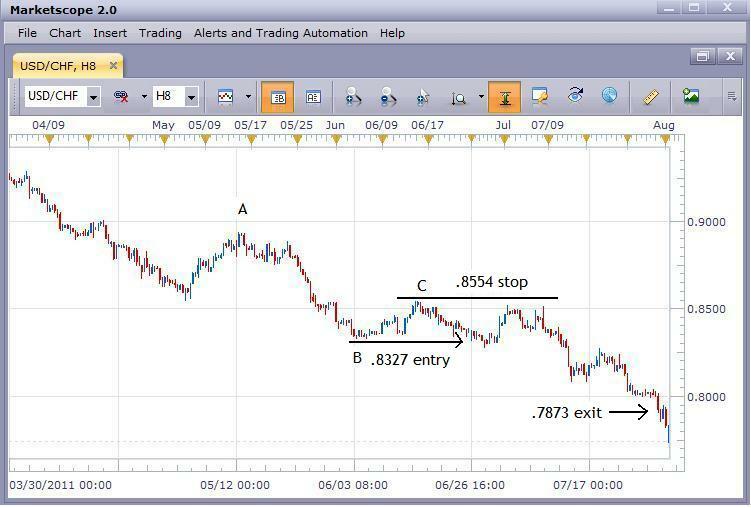 As the market moves back down towards point B, the trader enters a sell entry order at the .8327 level, one pip below point B. An initial protective buy stop is also placed at the .8554 level, which is one pip above the point C high of .8553. This represents a risk of 227 pips. Since the USD/CHF was worth $1.20 a pip for every 10K position at the time, this represents a total risk of just over $272. So if a trader had a $20,000 account balance, they could only open three 10K lots since their maximum risk would be $1,000 (5% of $20,000) and three lots on this trade would represent a risk of just over $816. A limit order to take profit is also set at twice that initial risk of 227 pips. That would be a total of 454 pips which means a target at the .7873 level. You can see that this level was reached in early August resulting in a profitable trade.